Do you find yourself in the midst of deciding on where to go to dinner? Which new car to buy? Heck, making a decision about really anything…Next you go to your computer to research and find out how it’s rated and what people are saying about the specific thing your trying to decide on! Online reviews are extremely important for both consumers and businesses! The power and importance of online reviews for consumers AND for businesses a like is paramount! There are hundreds of websites out there that offer reviews and information on local businesses in YOUR area! We wanted to look at the impact of online reviews on a consumer and on a business. In addition, we wanted to offer an overview of the top review websites that should be used by both consumers and businesses. What happens when consumers cannot find online reviews or information about your business? A consumer that cannot find reviews from other consumers who have utilized your service in the past, often times they’re “on to the next.” Most consumers are now very internet savvy. If someone is unable to find information or reviews on a business when doing a web search it can make them begin to question, why? When this happens it sometimes leads to a general search of the specific product or industry that they are looking for. For example, if someone is searching for “XYZ Real Estate Company” who they’ve heard about in the past but aren’t able to find ANY web presence or reviews, they will likely do a search of “Real Estate Companies in Rochester NY.” From a business standpoint, this is the last thing that XYZ Real Estate wants to have happen, the consumer finding information about their competitors! A Consumer Finds Online Reviews and They’re Mainly Negative! Negative reviews can be detrimental to a business. Negative reviews can severely hurt a businesses reputation. Make sure you handle them correctly! If a restaurant has negative review after negative review, are you going to make your reservation there? Potential customers are going to think twice! Whether it’s a restaurant, dentist, real estate company, or any business for that matter, negative reviews should not go ignored! Handling the negative reviews can be very tricky. First things first, DON’T lash out at the customer. Does Amy’s Baking Company ring a bell? Known for their online meltdown (see below) after the airing of Kitchen Nightmares episode in May 2013. Amy’s Baking Company social media meltdown. One thing to keep in mind when responding to a negative review is to respond diplomatically. This is a businesses opportunity to shed more light on the situation that their customer is referring to in their review. It also gives the business the chance to show that they are monitoring their online reputation AND also that they take the time to respond to their customers. In most cases businesses don’t respond to reviews, good or bad. Remember online engagement is extremely important with today’s consumer. Helpful Review Websites for Consumers…and… that Businesses Need to be on! Have you heard of Google? Our guess is absolutely and you likely utilize it on a daily basis. Google+ is a growing platform for businesses especially since it has a significant impact on search result rankings. 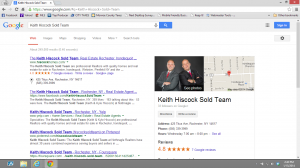 An example of our Google+ page and reviews on a Google search result of Keith Hiscock Sold Team. As a consumer looking for information or reviews on a service or product, a company with a verified Google+ page should show at the top of your search results. Google+ gives customers the opportunity to write reviews and give their rating of 1-5 stars, 1 being poor and 5 being excellent. In addition to the reviews and ratings, businesses can add images of their services, their establishment, or anything that they may choose. Visit the Keith Hiscock Sold Team on Google+. Yelp is extremely popular in the restaurant industry. It has a great mobile platform allowing consumers to have access to reviews on the go! Not only are customers able to review businesses (1-5 stars) but they can also add photos from their experience, visit the businesses website, and view hours of operation. 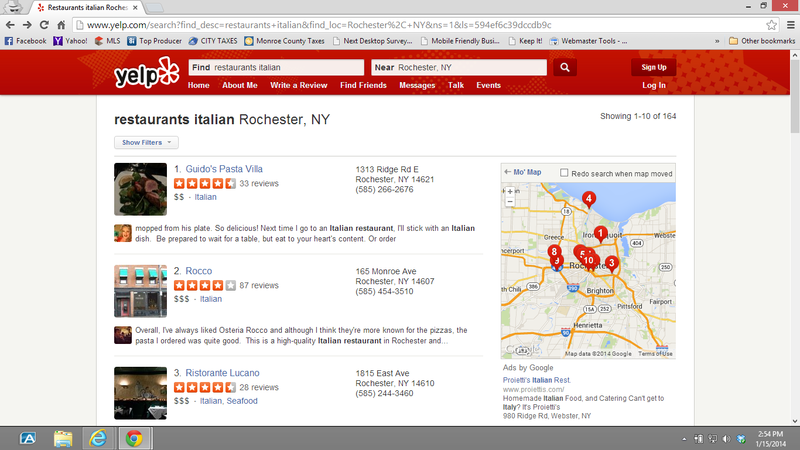 One of our favorite Italian restaurants, Guido’s Pasta Villa, has the highest Yelp star rating of Rochester’s Italian restaurants. Visit the Keith Hiscock Sold Team’s Yelp profile. Remember when phone books were thick enough to use as booster seats? Most believe today that the Yellow Pages is extinct, but the truth is, it’s not! The Yellow Pages has shifted their focus from their “old school” print book to their internet based “book.” What’s great about their new “book” is they now allow customers to give reviews and ratings to businesses. Visit the Keith Hiscock Sold Team’s Yellow Pages profile. Angie’s List is an excellent review website IF the consumer doesn’t mind paying a small yearly fee. The cost varies from zip code to zip code. Click here to enter your zip code to see what the monthly and yearly cost would be for your area! One of the primary reasons Angie’s List decided to make their review service membership based is they verify each and every review that is entered onto their website! Visit the Keith Hiscock Sold Team’s Angie’s List profile. If you have any questions regarding the use of these review websites, why it’s important for consumers and businesses to utilize these websites, or on the process of how to write reviews of your own on local businesses, please contact us!